MYH9-related disease is a rare disorder associated with the risk of developing progressive sensorineural hearing loss, nephropathy, cataracts, and/or liver enzyme alterations during childhood or adult life. To date, many reports on MYH9 disorder exist but only a few have provided a detailed description of the onset, degree of deafness, and shape of audiogram in individuals with this disorder. Further, the correlation between genotype–phenotype and hearing impairment and these descriptions were not very detailed. We described two particular cases that stand out from those described in the literature: two cases with an early diagnosis and an early auditory evaluation with the possibility to analyze the initial stages of hearing impairment. In addition, we confirm and reinforce the idea recently described in the literature that patients with mutations in the head domain have a higher risk of early-onset deafness than patients with mutations in the tail domain. All patients with MYH9-RD present since birth with thrombocytopenia and inclusions of NMMHC-IIA in leukocytes – macrothrombocytopenia. MYH9 disorder encompasses four syndromes that have been considered for many years to be distinct disorders: May–Hegglin anomaly (MHA; OMIM #155100), Sebastian syndrome (SBS; OMIM #605249), Fechtner syndrome (FTNS; OMIM #153640), and Epstein syndrome (EPTS; OMIM #153650). To date, many reports on MYH9 disorder exist, but only a few have provided a detailed description of the onset (because the suspicion and diagnosis of the disease is often late), degree of deafness, and shape of audiogram in individuals with this disorder. Further, the correlation between genotype–phenotype and hearing impairment and these descriptions were not very detailed. 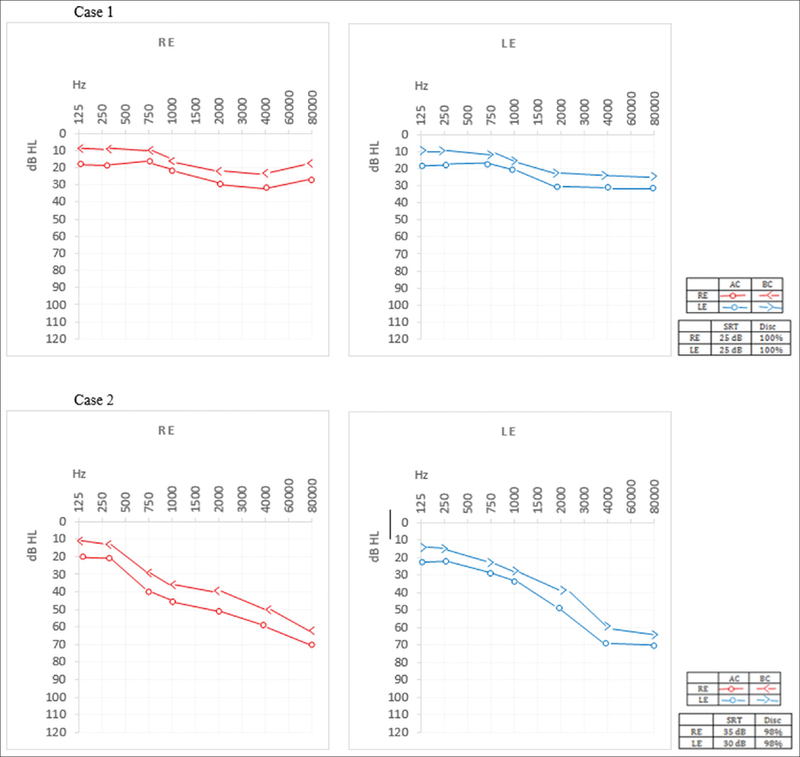 Thus, we present the detailed description of two cases with early diagnosis of MYH9-RD and its hearing impairment as well as the genotype–phenotype correlation. The patient was referred at the age of 1 year to a nephrology unit because of mild proteinuria without alteration of kidney function. There were no other complaints apart from easy bruising since birth. Family history revealed that his grandfather had renal pathology requiring hemodialysis and thrombocytopenia. History of thrombocytopenia in more distant family members was also present. In view of these factors, the suspicion of MYH9-RD emerged. Consecutive genetic investigations confirmed the pathology. In subsequent urinalysis and imaging investigation by kidney ultrasound, renal dysfunction has not been confirmed. At 4 years of age, the patient was referred to our otolaryngology unit for audiological screening, without any complaint or suspicion of hearing loss. Audiological evaluation showed bilateral mild symmetrical SNHL, more evident at higher frequencies, starting from 1000 Hz [Figure 1]. Imaging investigations by computerized tomography (CT) did not show inner ear malformations or retrocochlear pathologies. The patient presents an excellent psychomotor development, with good evolution of the language and learning; therefore, the patient does not benefit from auditory rehabilitation until now. The patient was referred at the age of 2 years to a hematology unit because of severe thrombocytopenia and easy bruising. Family history revealed that his mother and grandmother also had chronic thrombocytopenia. Due to her family history, she is evaluated and followed in genetics consultation. A diagnosis of MYH9-RD was suspected and successively confirmed at the age of 3 years. At the time of diagnosis, the main symptoms were as follows: easy bruising, recurrent epistaxis, easy gum bleeding, and prolonged bleeding after eruption of teeth. Hearing impairment was referred from the age of 13 years. The first audiological evaluation showed bilateral moderate symmetrical SNHL, more evident at higher frequencies [Figure 1]. Consecutive imaging investigations (CT) did not show inner ear malformations or retrocochlear pathologies. The patient received benefit from bilateral hearing aids. No signs of kidney impairment, cataract, or chronic elevation of transaminases were found. The basic clinical features and patients' clinical presentation at diagnosis are summarized in [Table 1]. MYH9-RD is a rare autosomal dominant disorder associated with the risk of developing progressive SNHL, nephropathy, cataracts, and/or liver enzyme alterations during childhood or adult life. In the experience of the Italian Registry for MYH9-RD, diagnosis was reached at a mean age of 36 years with a diagnostic delay of about 28 years after the first clinical manifestation of MYH9-RD. Mean age at onset of hearing impairment was 21 years and severe-to-profound deafness occurred after a mean age of 11.5 years. We described two particular cases that stand out from those described in the literature. In the first place, we described two cases that obtained a suspicion and early diagnosis of the pathology (at 1 and 3 years old). In addition, they had an early referral and evaluation by otorhinolaryngology (at 13 and 4 years old). This reflects the better recognition of this disease by clinicians and a more timely reference, sometimes even before the onset of symptoms or some degree of hearing loss. Hearing impairment is limited to high frequencies at clinical onset and in mild forms, but it progressively involves all frequencies in severe phenotypes. In the present study, we analyzed the initial stages of hearing impairment in both cases. We found a bilateral mild symmetrical SNHL, more evident at higher frequencies, which is consistent with previous reports. SNHL is one of the most frequent manifestations of the MYH9-RD., In our study, in addition to reporting two cases of MYH9-RD with hearing loss, we showed that hearing impairment often arises earlier than other pathologies with renal, hepatic, or visual involvement. The analysis of high-resolution temporal bone CT scans ruled out middle and inner ear malformation in both cases, which is in accordance with the cases described in the literature. As all conventional myosins, it has a hexameric structure formed by one heavy chain (NMMHC-IIA) dimer and two pairs of light chains. Each NMMHC-IIA molecule recognizes an N-terminal head domain (HD) responsible for enzymatic activity and a C-terminal tail domain (TD) mainly responsible for myosin assembly. Genotype–phenotype studies showed that patients with mutations in the HD have a higher risk of early-onset and severe deafness than patients with mutations in the TD 10. This idea, recently described in the literature, is reinforced by our two cases. In both cases, there is an involvement of the HD and an early hearing impairment was found. 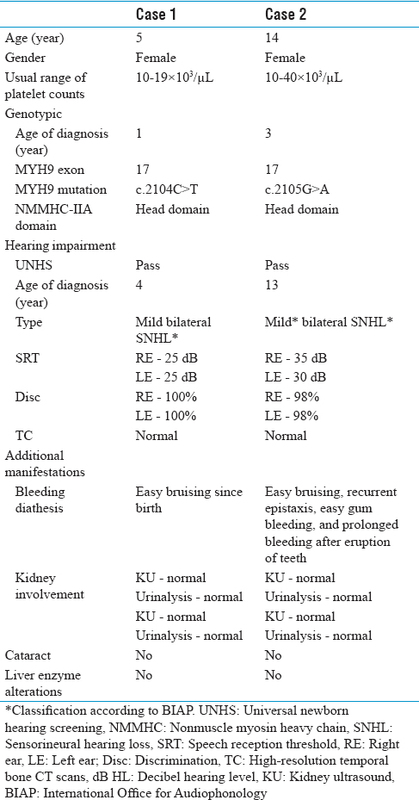 From the otolaryngologist's point of view, the association of bilateral sensorineural deafness with a personal or familiar history of thrombocytopenia, possibly associated with the other nonhematological manifestations of the disease, represents the key element for raising diagnostic suspicion of MYH9-RD. For us, the desired and ideal in MYH9 disorder, after diagnosis, would be the immediate reference to otorhinolaryngology, even in asymptomatic cases, for the early identification of hearing impairment and subsequent follow-up. Seri M, Cusano R, Gangarossa S, Caridi G, Bordo D, Lo Nigro C, et al. Mutations in MYH9 result in the May-Hegglin anomaly, and Fechtner and Sebastian syndromes. The May-Heggllin/Fechtner Syndrome Consortium. Nat Genet 2000;26:103-5. Balduini CL, Pecci A, Savoia A. Recent advances in the understanding and management of MYH9-related inherited thrombocytopenias. Br J Haematol 2011;154:161-74. Canzi P, Pecci A, Manfrin M, Rebecchi E, Zaninetti C, Bozzi V, et al. Severe to profound deafness may be associated with MYH9-related disease: Report of 4 patients. Acta Otorhinolaryngol Ital 2016;36:415-20. Kunishima S, Saito H. Advances in the understanding of MYH9 disorders. Curr Opin Hematol 2010;17:405-10. Pecci A, Biino G, Fierro T, Bozzi V, Mezzasoma A, Noris P, et al. Alteration of liver enzymes is a feature of the MYH9-related disease syndrome. PLoS One 2012;7:e35986. De Rocco D, Zieger B, Platokouki H, Heller PG, Pastore A, Bottega R, et al. MYH9-related disease: Five novel mutations expanding the spectrum of causative mutations and confirming genotype/phenotype correlations. Eur J Med Genet 2013;56:7-12. Ganaha A, Kaname T, Shinjou A, Chinen Y, Yanagi K, Higa T, et al. Progressive macrothrombocytopenia and hearing loss in a large family with DIAPH 1 related disease. Am J Med Genet A 2017;173:2826-30. Eddinger TJ, Meer DP. Myosin II isoforms in smooth muscle: Heterogeneity and function. Am J Physiol Cell Physiol 2007;293:C493-508.